Shortly after arriving, Peacock started a liquor business with George Freeth (Freeth’s son, George Douglas Freeth Jr, is noted as the father of California surfing.) (Whitcomb) By 1890 Freeth had departed and the firm became known as WC Peacock & Co. Since 1873, the property had been used as a hotel and saloon (apparently, the initial retail spirit license for it was issued to William Lowthian Green – Freeth’s father-in-law.) In 1884 the saloon was sold, then sold again between that year and 1886, when Peacock owned it. In its early years, the saloon was particularly popular with sailors, the Sailors’ Home being next door. In the 1890s, Walter joined other Honolulu elite who constructed mansions along the Waikīkī shoreline, including James Campbell, Frank Hustace and William Irwin. The wealthy discovered the ultimate destination of Waikīkī. Peacock also built his own a pier (Peacock Pier.) Nearby was an early commercial venture, the Long Branch Baths (offering sea bathing in Waikīkī’s waters.) Down the way, Liliʻuokalani also had her own pier. Then, Peacock proposed another Hawaiʻi lasting legacy. In the late-1890s, with additional steamship lines to Honolulu, the visitor arrivals to Oʻahu were increasing. In 1896, Peacock proposed to build Waikīkī’s first major resort to provide a solution to the area’s main drawback – the lack of suitable accommodations on the beach. The main hotel had 75-five rooms. This does not include the entire lower floor and the large Peacock cottage on the grounds. The lower, or first, floor of the hotel will be given over to a billiard parlor, saloon, office, library, reception parlor, etc. It was planned to make a club house of the Peacock cottage until such time as it may be required for regular hotel purposes. The rooms on the second, third and fourth floors are large and are so joined together that they may be fitted in any number of manner for family or excursion parties. Above the hotel proper is a central tower in which is a fifth floor, and above that is a covered roof garden. From the latter a perfect view was to be had of the sea and most of the city of Honolulu. The Moana Hotel officially opened on March 11, 1901. Designed in the old colonial style architecture of the period, it was the costliest, most elaborate and modern hotel building in the Hawaiian Islands at the time. Each room on the three upper floors had a bathroom and a telephone – innovations for any hotel of the times. The hotel also had its own ice plant and electric generators. In 1905, Peacock sold the hotel to Alexander Young, a prominent Honolulu businessman with other island hotel interests. After Young’s death in 1910, his estate continued to operate the hotel. In 1918, five-story concrete additions were added to the original wooden structure changing the floor plan from a simple rectangle to the present H-shaped plan that encloses the Banyan Court on three sides. Amasa Leland Stanford was born and grew up in New York; he was a lawyer. Stanford married Jane Eliza Lathrop on September 30, 1850; they first lived in Port Washington, Wisconsin, then New York, and then they moved West after the gold rush, like many of his wealthy contemporaries. Stanford made his fortune in the railroads; he co-founded and was president of the Central Pacific Railroad (it formed part of the “First Transcontinental Railroad” in North America; It is now part of the Union Pacific Railroad.) He served as California Governor and US Senator. In 1868, the Stanfords had their only child, a son, Leland DeWitt Stanford (later known as Leland Stanford Jr.) In 1876, Stanford purchased the Rancho San Francisquito for a country home and began the development of his famous Palo Alto Stock Farm. Within weeks of his death, the Stanfords decided that, because they no longer could do anything for their own child, “the children of California shall be our children.” They quickly set out to find a lasting legacy to memorialize their beloved son. Ultimately, they decided to establish two institutions in Leland Jr’s name. The ‘Leland Stanford Junior University’ was founded in 1885; on October 1, 1891, it opened its doors with 15 faculty and more than 400 students (David Starr Jordan served as president.) The Leland Stanford Junior Museum opened in 1894. The university was coeducational, in a time when most were all-male; non-denominational, when most were associated with a religious organization; and avowedly practical. 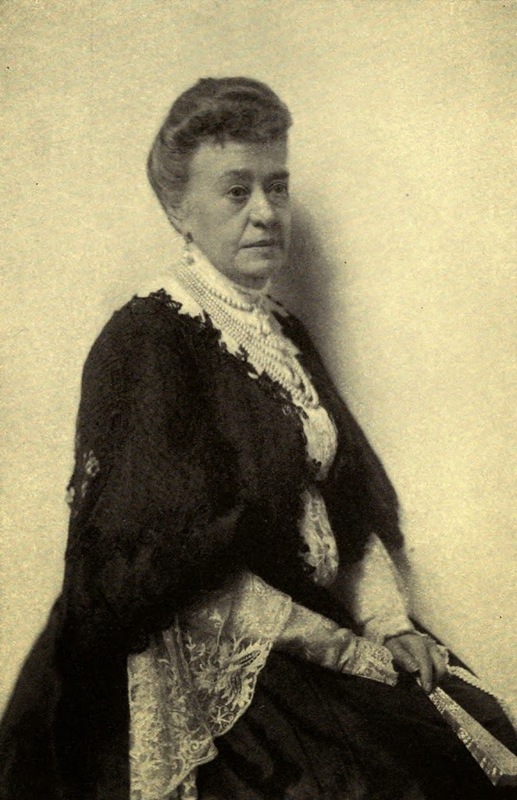 On June 1, 1903, Jane granted control of the university’s endowment and management to the Board of Trustees, although she remained a member of the board and continued to be involved in its operation. Of the incident, Mrs Stanford said: “How dreadful if I had died that time. People might have thought I committed suicide.” (The San Francisco Call, March 7, 1905) Following the incident, she planned a trip. Dr Robert WP Cutter wrote a book, ‘The Mysterious Death of Jane Stanford,’ wherein he implies that Stanford’s President at the time, David Starr Jordan, was involved in a cover-up of the circumstances surrounding Mrs Stanford’s death. The image shows Jane Stanford. In addition, I have included other related images in a folder of like name in the Photos section on my Facebook and Google+ pages. Webley Edwards was born November 11, 1902 in Corvallis, Oregon. He attended Oregon Agricultural College (OAC – it was later named Oregon State University) where he became the first student manager of campus radio, KOAC. After graduating from OAC in 1927, Webley moved to Hawaiʻi in 1928 to work as a car salesman and play semi-pro football. Fascinated with the local music, in 1935, he arranged for a two-week trial run for a radio show of “authentic” Hawaiian music. On July 3, 1935, Edwards created and first aired a radio program called “Hawaiʻi Calls” featuring Hawaiian music and entertainment. The first show reached the West Coast of the continental US through shortwave radio. Although the program enjoyed a growing popularity on the mainland, Edwards initially had a hard time making ends meet and solicited support from the Hawaiʻi Tourist Bureau. Hawaiʻi was calling, he seemed to suggest, and to the home-bound listener freezing through an Iowa or Montana winter, making a vow to one day visit the Islands became irresistible. Except for an apparent break during World War II, the radio program aired continuously since its inception. From the time of inception until January of 1972, Webley Edwards was Hawaiʻi Calls’ announcer and leading personality. The weekly program was typically taped before a live audience at the Moana Hotel in Waikiki. Periodically, they took the show on the road and broadcast from a neighbor island. Throughout the 1950s, Edwards compiled and produced a series of Hawaiian music collections for Capitol Records. He even wrote songs under a pseudonym, John Kalapana. In addition, he helped promote local performers, including Alfred Apaka, George Kainapau, Haleloke, and Simeon and Andy Bright. (Ankeny) In addition, Al Jolson and Arthur Godfrey were among the many guests featured on the program. After Edwards left the program, Danny Kaleikini, a well-known Hawaiʻi entertainer and singer, was the announcer and a performer for the program. (US District Court Records) The program ended August 16, 1975. Late in his career, Edwards made a successful run at politics, serving for more than 14-years in Hawaiʻi’s territorial legislature and then the state legislature. Spending his last few months in a Honolulu assisted-living facility, he died October 5, 1977, after suffering a heart attack. On October 3, 1992 there was a temporary return of Hawaiʻi Calls, taped at the Hilton Hawaiian Village’s beachside Tropics Showroom, then transmitted via satellite to affiliates. It ran for about a year, but it failed to attract enough financial support to continue. The image shows Hawaiʻi Calls from the Moana. In addition, I have included other related images in a folder of like name in the Photos section on my Facebook and Google+ pages. Repeatedly evidenced in the early years of rail across the continent, railroads looked to expand their passenger business by operating hotels at the ends of the lines. Once a railroad was being built to a new location, the land speculators would prepare for cashing in on their investment. A hotel would typically be in place by the time the railroad service began. Prospective buyers needed to have a place to stay, so they could become enamored of the scenery and have time to be enticed into buying a piece of property. Likewise, an ocean liner, while it served as a moving hotel, needed to make sure people had places to stay where the cruise ships stopped. Simply look at the early history of trains and ships, the pattern is apparent. Several in Hawai‘i followed this example in the planning of their transportation systems. Dillingham’s Haleiwa Hotel was conceived as part of a larger concept. O‘ahu Railway & Land Company was built with the primary purpose of transporting sugar from western Honolulu and the North Shore to Honolulu Harbor. Dillingham hoped to capitalize on his investment (and expand upon the diversity of users on his trains) by encouraging passenger travel as well; his new hotel was a means to this end. It thrived. The Moana officially opened on March 11, 1901. Its first guests were a group of Shriners, who paid $1.50 per night for their rooms. Matson Navigation Company bought the property in 1932; they needed land-based accommodations equally lavish to house their cruisers to Hawaiʻi. Over the course of Matson’s ownership of the Moana, it grew along with the popularity of Hawaiian tourism. Two floors were added in 1928 along with Italian Renaissance-styled concrete wings on each side of the hotel, creating its H shape seen today. With the success of the early efforts by Matson Navigation Company to provide steamer travel to America’s wealthiest families en route to Hawaiʻi, Captain William Matson proposed the development of a hotel in Honolulu for his passengers. This was in hope of profiting from what Matson believed could be the most lucrative endeavor his company could enter into. The Royal Hawaiian (Pink Palace of the Pacific) opened its doors to guests on February 1, 1927 with a black tie gala attended by over 1,200 guests. The hotel quickly became an icon of Hawaiʻi’s glory days. 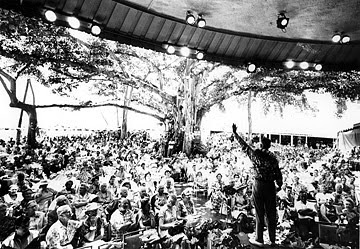 After the war, tourism to Hawaiʻi expanded in the mid-1950s. To capitalize on this increasing boom in travel and trade, Matson constructed its third hotel, the Princess Kaʻiulani in 1955. Formerly the site of the Moana cottages, the land was cleared in 1953 to make way for a new high-rise. At the time, the hotel’s Princess Wing was the tallest building in Hawaiʻi (11 stories, 131 feet above the ground). It was the largest hotel built in Hawai‘i, since The Royal Hawaiian in 1927. In 1959 (the year Hawai‘i entered statehood and jet airline travel was initiated to the State,) Matson sold all of its hotel properties, including the four year-old Princess Kaʻiulani Hotel, to the Sheraton hotel chain. Hotels weren’t the only end-of-the-line attraction. The Waikīkī Aquarium opened on March 19, 1904; it is the third oldest aquarium in the United States. Its adjacent neighbor on Waikīkī Beach is the Natatorium War Memorial. Then known as the Honolulu Aquarium, it was established as a commercial venture by the Honolulu Rapid Transit and Land Company, who wished to “show the world the riches of Hawaiʻi’s reefs”. 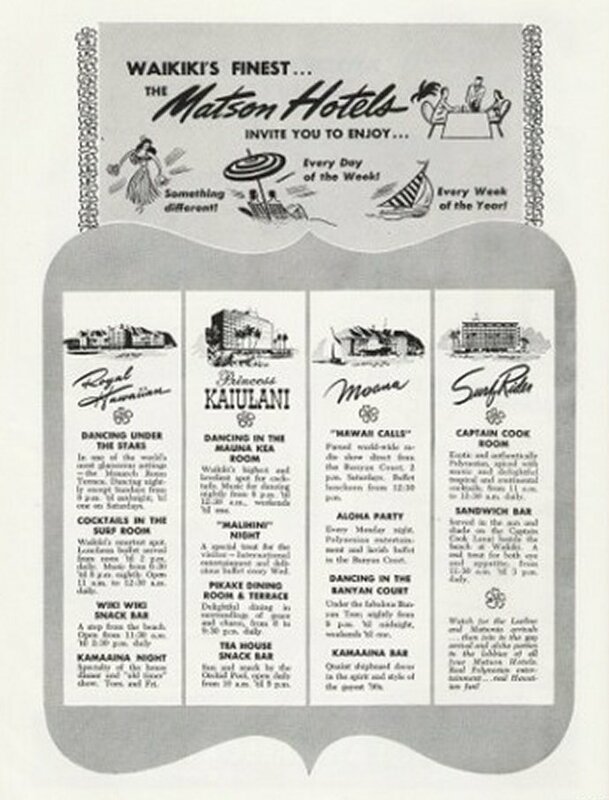 The image shows a 1958 advertisement for the Matson Hotels in Hawaiʻi (from eBay.) In addition, I have included some other Matson advertisements in a folder of like name in the Photos section on my Facebook and Google+ pages.